Who was the family of Amos Orahood, husband of Olive West? Researchers have proven that the Amos who was married to Scotia Smith died in 1862 and was the son of Samuel and Mary. They suspect that the Amos who was married to Olive West was the son of Amos and Susanna and that Caleb and Elizabeth had no son named Amos. A bible of Amos and Susanna includes the names and birth dates of their children including a son, Amos, born Oct. 23, 1835. Children By looking at census records for 1870, 1880, and 1900, researchers determined that the Amos Orahood who was married to Olive West had four children: Mary, William, Eva May, and Ella Day. Ella married Reuben Cleveland and lived until 1944. Mary probably married Jacob Smith in 1880. By 1900, one of the children had died but nothing further is known of any of the children but Ella. The obituaries give us the information that one of the daughters was married to Roy Mitchell or Michel and lived in Marion. The two other daughters were living and the son, William had died. 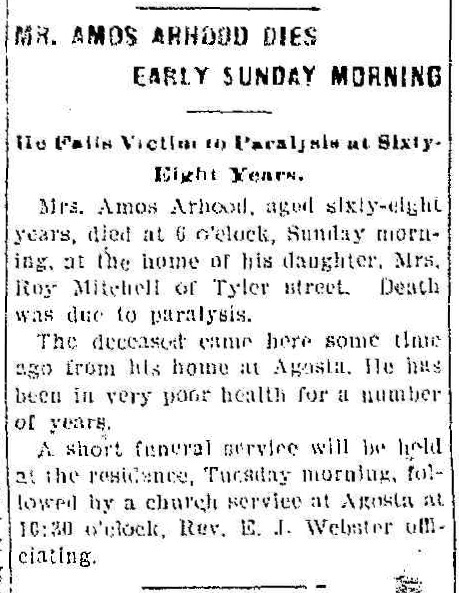 We also learn from the obituaries that Amos was born Nov 24, 1835 and at the time of his death had one sister and one brother living. Ancestry.com In 1900 and 1910, Leroy Mitchel and his wife Eva were living in Marion with their children. By 1920, Leroy had become a Methodist minister and the couple had moved to Grant County, Indiana. Siblings and parents By examining the death dates of the supposed siblings of the various Amos Orahoods on Ancestry World Tree, only one had just one brother and one sister who would have been alive in 1903. This is the son of Amos, Sr. and Susanna. To reconcile the birth dates of Amos Orahood from the bible and the obituary, it is helpful to notice that the birth dates in the bible were probably all written at the same time, some time after the fact. The bible was printed after 1829 and the first five children were born before that. The date in the obituary was given by one of Amos's children and is one day and one month different from the date in the bible. Given the lack of attention to such details in those days, that is close enough to not be considered a mismatch. Family The obituaries gave us information on Amos's daughter Eva so we could trace her through the years and the fact that William was the child who had died before 1900. The obituary gave us data to confirm that Amos is the son of Amos and Susanna. Mailing List Much more information on Orahoods is in the Orahood mailing list, including recent discoveries that confirm relationships and add new data. While pedigrees, including Ancestry World Tree, give a static picture of a family, mailing lists include updates that often do not make it to the online pedigrees.